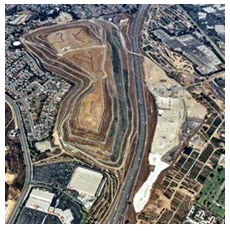 The Operating Industries, Inc. (OII) Landfill Site, Monterey Park, CA, is a 190 acre US Environmental Protection Agency (USEPA) Superfund site. EWM technologies were the first to process data collected at a cost of 20 million dollars. EWM Group’s concise informative displays assisted in active participation of regulators, stakeholders, and other decision makers. 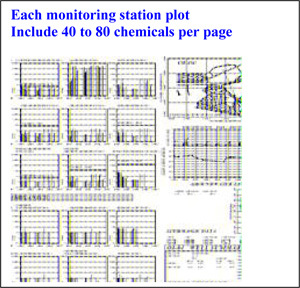 EWM SHOWME spider diagram for each chemical of concern displays locations of all monitoring wells. 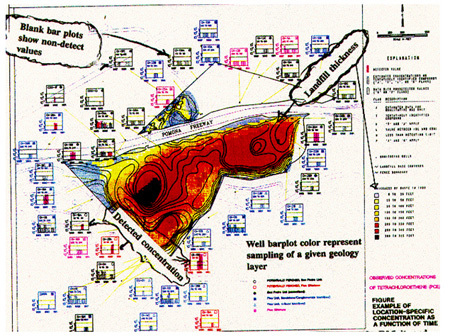 Each geologic layer wells were displayed by explicit color. 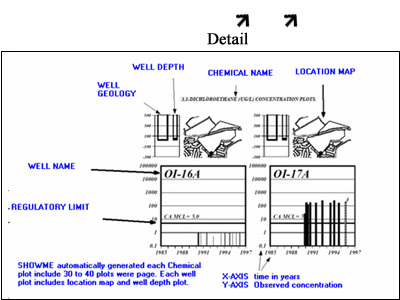 Well depth was included in each sub-plot to evaluate contaminant status at each depth. 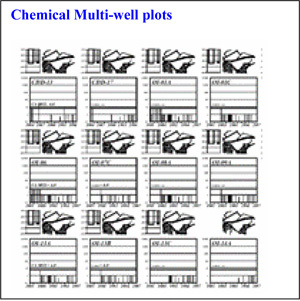 Chemical plots includes all data for the given well to identify historical trends. Data collection costs are in millions of dollars. At fraction of cost of data collection, EWM plots assists in making informed decisions, which are acceptable to regulators, stakeholders, and the public.